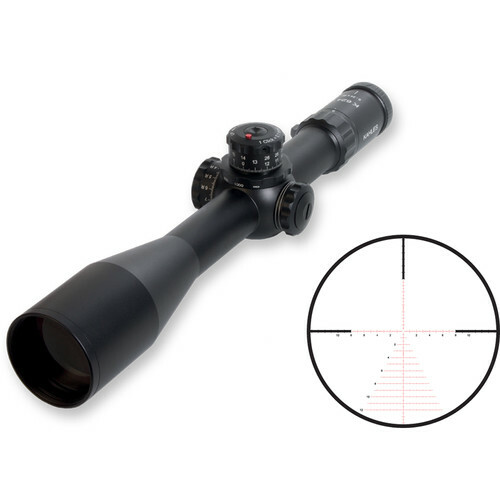 Delivered by a pioneer in the field of telescoping sights, this right-handed KAHLES 6-24x56 K624i Riflescope offers time-proven opto-mechanical design, durability, precision, and ergonomics. Its 6-24x optical system, an extra-wide 56mm objective, and proprietary AMV coatings bring optical clarity, especially at the edge of the reachable range. The lenses deliver high resolution and contrast, edge-to-edge clarity, and 95% transmission of light. The 1st focal plane SKMR3 illuminated reticle features three posts in the upper half of the field and a fully illuminated crosshair. The crosshair is defined by fine milling marks and a system of horizontal lines cascading down from the center point. The reticle gives accurate range, ballistic, and wind compensations at all magnifications and has an inclination-based Automaticlight illumination. This produces a bright red glow when the scope is canted below a 45° angle, instantly turns off the illumination when the scope is canted at an angle above 75°, and provides a two-minute waiting period before turning off the illumination when the inclination angle is between 45 and 75°. This K624i telescopic sight is constructed of hardened steel and machined to deliver wear-resistant performance, high accuracy, and impeccable repeatability. The pinch-and-turn elevation turret has a second rotation indicator, refined zero stop, and also houses a parallax corrector ring. Optimized for right-handed users, the windage dial is situated on the right side. Its graduation scale offers precise indexing, enabling you to make fast and accurate adjustments across the entire range: from a zero to a maximum and back. The scope's waterproof (submersible), dustproof, and fogproof housing is crafted around its 34mm aluminum maintube and has a scratch-resistant anodizing finish. Box Dimensions (LxWxH) 21.1 x 4.3 x 4.3"
It seems like just the scope. And featuring a special selection of advanced illuminated reticles. You might want to get a battery as well B&amp;H # KOCR2032.